From an early age Simon Santow was interested in world affairs, an interest cultivated by his parents. This drove his passion for journalism and led him to study a Bachelor of Arts (Communication – Journalism) at CSU. Fresh out of University, Simon joined the ABC as a cadet in 1996. He has worked in the Perth, Sydney, and Canberra Parliament House newsrooms, for both TV News and Radio Current Affairs. Today Simon Santow is a household name, whose resonant voice is synonymous with programs like The World Today, AM and PM. Here, Simon explains the importance of telling the stories that matter. At school I... often wondered what I would do for a career but I knew it would be something verbal. My childhood was... filled with opportunities. My parents encouraged me to participate, listen as well as speak and, above all, they debated things around the kitchen table. So, curiosity came from an early age. As a child, I was most curious about... how easily one country could threaten another. Memories of Thatcher, Reagan, Hawke, etc stoked a lifelong interest in global as well as domestic politics. I chose CSU because… I’d heard it was the best place to learn to become a journalist. My best experience at CSU... was living on a rural property 20kms out of town. My worst experience at CSU... was almost running out of tank water. At university I was inspired… by being in a big country town. Bathurst’s politicians, police, farmers, teachers and citizens all allowed trainee journalists to practise on them. Today I’m motivated… by helping to ensure my part of the ABC broadcasts the stories that matter to its audiences listening in the car, at home, on the internet, or on the tractor. I still think that journalists have skills which are vital to society. Not everyone can ask the right question, or have the confidence to tackle someone who won’t engage on a subject that’s often important for the rest of the community to know about. In my profession it is important to… follow your instinct and not be deterred by spin designed to muddy the waters. It’s equally important to have an open mind and be prepared to write a story differently from how you might have imagined you’d write it. I never dreamed I would… be the proud dad of two growing children. The biggest influence in my life... is a huge question. So I am going to dodge it by saying I have had all sorts of people and experiences influence me. It’s easy to look to the great leaders of our time (and who could go past Nelson Mandela) but sometimes it’s the little people that you meet who help shape what’s important in life. I’m most proud of… doing some stories along the way that may have prompted the powerful to rethink their views. My greatest achievement is... getting the balance right between career and family. In the future I’d like to… look back on a job well done. The topic I Tweet about most is... football. And every now and again I use Twitter to hold someone to account over what they have said or written. The best piece of advice I ever received... was that listening is just as important as speaking. The single-most important issue in the world is… the environment. Everything from feeding the planet to ensuring we can all breathe and flourish depends on it. The thing I wish I had done but never got around to... would be to represent my country... in anything! 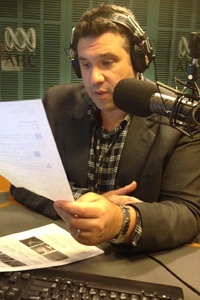 If I could do it all again I... would still work for the ABC. One last thing... CSU was a perfect fit for me. I was 23, a mature age ‘fresher’, and experiencing living in the bush for the first time. Nearly running out of water taught this city-slicker a thing or two - my kids will attest that their baths in Sydney are always too full!